The Vote is 224 to 206 in the House on procedures….clearing the way for the vote tonight….. Landmark health-care legislation passed a series of procedural hurdles in the House of Representatives and headed toward a crucial vote on final passage Sunday night after President Obama reached a deal with Democratic holdouts on an executive order designed to allay their concerns about abortion funding. After 5 1/2 hours of often contentious floor speeches and a string of procedural votes, the House approved the rules for final debate on a Senate-passed health-care bill and a House package of fixes by a vote of 224 to 206. That vote set the stage for what House Democratic leaders hoped would be the penultimate milestone later Sunday night of Obama’s year-long effort to overhaul the nation’s $2.5 trillion health-care system. Following the House votes, Obama planned to launch a campaign aimed at countering conservatives’ criticisms of the health-care bill, aides said. Rallying last-minute support for the overhaul, Obama announced Sunday afternoon that he would issue an executive order after passage, attesting that the bill is consistent with longstanding restrictions on the use of federal funds for abortions. Appearing with Stupak were half a dozen other holdout Democrats. With them on board, “we’re well past” the 216 votes needed in the House to approve the health-care legislation, Stupak said. White House pictures from Talkandpolitcs.….. Check out these photos from inside the White House today, as congress debates the Health Bill and the final vote in the House of Reps.
Who’s in play: House health-care vote….link to the full list…..
How members voted on health-care legislation Nov. 7, where they stand now and who is still undecided. Thirty-nine Democrats broke with their party and voted no. One Republican voted yes, but is on the record as saying he will vote no this time around. 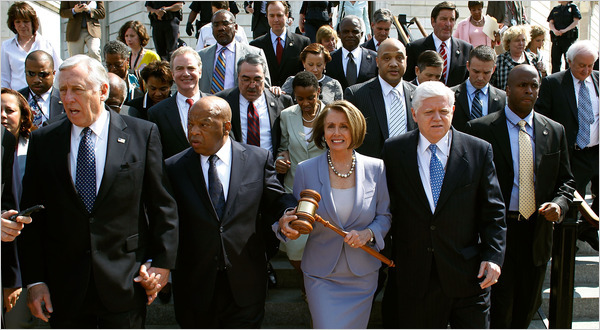 Earmarks are being thrown under the Bus by the Democrats in the House……. Which is such a good thing…that the Dog wants to see how long they remain under the Bus?.…. There is a lot of money and influence we’re talking about here……. House Democratic leaders on Wednesday banned budget earmarks to private industry, ending a practice that has steered billions of dollars in no-bid contracts to companies and set off corruption scandals. The ban is the most forceful step yet in a three-year effort in Congress to curb abuses in the use of earmarks, which allow individual lawmakers to award financing for pet projects to groups and businesses, many of them campaign donors. Both parties are seeking to claim the ethical high ground on the issue by racing to rein in a budgeting practice that has become rife with political influence peddling. So far, though, the Senate is not joining in. House Democrats had tried to reach an agreement with their counterparts to ban for-profit earmarks, but the senators balked, Congressional officials said. Had the ban on for-profit earmarks been in place last year, it would have meant the elimination of about 1,000 awards worth a total of about $1.7 billion, leaders of the House Appropriations Committee said in announcing that, as a matter of policy, they will no longer approve requests for awards to for-profit groups. Many of those earmarks went to military contractors for projects in lawmakers’ home districts. Representative David R. Obey, the Wisconsin Democrat who leads the Appropriations Committee, said a series of criminal investigations, ethics inquiries and political embarrassments had prompted him to take stronger steps. Sen. Daniel Inoye (D-Hawaii), chairman of the powerful Senate Appropriations Committee, will not follow Rep. David Obey’s move to ban federal earmarks to commercial businesses. Obey is the top Democrat on the House Appropriations Committee. Inoye said he found the House’s directive both “quizzical” and not in the best interests of the country. The chairman said that the Predator drone, one of the military’s most successful weapons systems, came as the result of an earmark to a for-profit defense contractor. Inoye also noted that the growth in earmarking over the last decade, which the House criticized, has come primarily in the non-profit sector, so preventing for-profits from receiving earmarks would not address the problem the House says it has with the system. Not to be outdone by their Democratic counterparts, the House Republicans proposed a ban on all earmarks after Obey made his announcement. Regardless of the decisions by House Republicans and Democrats, Inoye’s move means that the House will still end up approving earmarks passed by the Senate. That’s because the House and Senate must approve conference reports that combine House and Senate versions of a bill before it becomes law. Congress awarded nearly $16 billion in earmarks for the current fiscal year, according to the watchdog group Taxpayers for Common Sense. He, He, he…..I thought so….the ban didn’t last 24 hours……somehow……. I think the Republicans knew this…. The Massa investigation is over…..he quit…..
Rep. Chris Van Hollen (D-Md.) 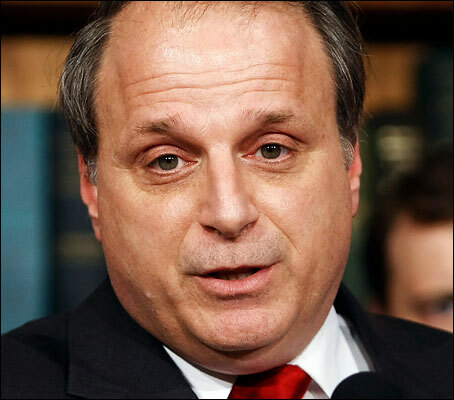 on Wednesday confirmed that the House ethics committee probe into groping allegations against ex-Rep. Eric Massa (D-N.Y.) has ended. In an appearance on ABC’s “Top Line” webcast, Van Hollen, an assistant to Speaker Nancy Pelosi (D-Calif.), was asked if an independent investigation in the charges will be opened now that Massa has resigned, rendering the ethics probe moot. The Committee on Standards of Official Conduct (ethics committee) only has jurisdiction over members, officers and employees of the House of Representatives. Since Massa resigned his seat on Monday afternoon, that puts him outside the purview of the ethics panel. Does anyone doubt why he gave up his seat? Here’s another Democrat to take off retirement watch lists. Representative Leonard Boswell filed nominating papers on Friday to run for an eighth term in Iowa’s third Congressional district (D+1). That’s no surprise, since Boswell has been saying he’ll run again since November 2008 and repeated that in January and February of this year. But ever since the National Republican Congressional Committee put Boswell on a potential House Democrat retirement list in December, influential analysts like the Washington Post’s Chris Cillizzahave been saying Boswell might retire. The foot-soldiers at The Iowa Republican blog did their part to keep the rumors going, despite the lack of evidence. Last month came another twist. An automated telephone survey went out in the district asking potential Democratic primary voters about potential Boswell alternatives. The calls rekindled rumors that Boswell was getting out and that an alternative candidate was being vetted. His 2008 campaign manager, Grant Woodard, has remained on his campaign staff. Recently, he brought on a finance director. I never heard from any respondents who received that robo-poll last month, but it didn’t sound to me like a genuine attempt by Democrats to vet alternatives to Boswell. At least five and up to seven Republicans are competing for the chance to run against Boswell this year. Republican insiders favor Jim Gibbons, but the crowded field may force the GOP nomination to be decided at a district convention. The House on Thursday approved a $15 billion measure intended to spur job creation by granting tax breaks to businesses that hire workers, as Democrats, bracing for new jobless figures, tried to show that Congress was doing something about stubborn unemployment. Democrats pushed through the measure on a mainly party-line vote of 217 to 201. They characterized the measure, which also funneled an extra $20 billion into road and bridge construction, as just the first step in a broad legislative push to bolster the economy and encourage hiring. Representative Bob Etheridge, Democrat of North Carolina, said the bill was “really all about our three most important priorities in this Congress: jobs, jobs, jobs.” He estimated that the measure could create one million jobs. Though the measure attracted bipartisan support when approved by the Senate last week, House Republicans were dismissive, saying it was cobbled together by Democrats for political purposes and would do little to spur new employment. And many Democrats, even though they backed the measure, considered it far too limited in scope. Just 6 Republicans joined 211 Democrats in backing the measure; 166 Republicans and 35 Democrats were opposed. “This is a no-jobs bill, this is a faux-jobs bill, this is a snow-jobs bill,” Representative Steven C. LaTourette, Republican of Ohio, said. Democrats in the House and Senate are eager to score some victories on job-related legislation even as they continue to be preoccupied with the fate of their health care overhaul. The bill passed by the House, which also extends the federal highway program and provides federal subsidies for public works bonds, was scaled back from a much larger measure in the Senate in an effort to speed it through. But even advancing the narrower measure has vexed Democrats. Senate Democrats had hoped the House would simply pass its measure so it would land on President Obama’s desk before a new jobless report on Friday. But House Democrats wanted several changes. They adjusted the bill to cover its costs more completely, to satisfy Democratic fiscal hawks. To attract liberal lawmakers who contended the measure was too meager, they added a provision to generate business for minority contractors. The revisions mean the measure will have to be reconsidered by the Senate, where it was unclear whether Republicans would seek to slow its progress. The centerpiece of the legislation is a plan to exempt businesses that hire people who have been out of work for at least 60 days from paying the 6.2 percent payroll tax on those employees through year-end. It also grants a $1,000 tax credit if the workers are kept on for a full year. The Question is…will the Democrats be able to get a few Senate Republican’s to vote the Bill? From Daniel G…… BREAKING NEWS; Announcement: Republican John E. Linder (R-GA 7) announces RETIREMENT…..
A lot of work this Saturday. Every time I finished a Post something new is popping up. Congressional Quarterly (CQ) has learned that longtime Georgia Congressman John E. Linder (R-GA 7) announced his Retirement at the local Gwinnett GOP Headquarters this morning. I’m sure POLITICO will have this up soon as well.